European Cycling Challenge, Launch Saturday 15 April, Glasgow Green. Record your mileage to show where we want cycle facilities! 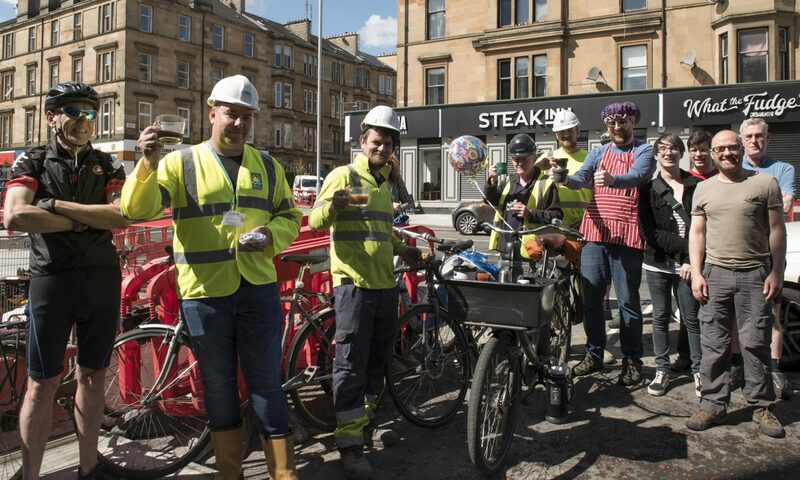 We have got to know about this year’s European Cycling Challenge whereby all of us cycling in Glasgow – and the surrounding areas (new for this year) can record our cycle journeys. GoBike has mapped the data from last year, which ties in well with Strava data and Glasgow City Council cordon count data, and has presented this evidence of where people cycle – and thus where we need good quality cycle infrastructure – to none less than the Transport Minister, Humza Yousaf. “This year’s European Cycling Challenge will be even bigger and better than last year. With involvement of all neighbouring local authorities, this years challenge will be inclusive of all your commute, leisure and utility riding. Whether cycling from East Kilbride to Glasgow, along to Croy station to get the train to Glasgow or Edinburgh, just along Byres Road, or on the Bears Way, all your journeys will count! There are also over 120 prizes for best riders and prize draws throughout just for taking part and getting out on your bike. To launch the challenge and encourage people to start to sign up, we will host a launch event on Saturday April 15th 11:00 – 13:00. This will take place at the Winter Gardens at Glasgow Green. This should help many of you get there as it’s right on the NCN 75 with good connection to all areas. To promote the sign up for the event we will have photocalls for those who want to show off their bikes, freebies including this year’s edition of snap bands and saddle covers, and prize draws on the day for cycling equipment. We will also have a Dr Bike to make sure your bike is the finely tuned machine you deserve. Light refreshments will be available between 11:00 and 13:00. So get out on your bike, come along alone or with family, get some freebies and lets show Europe that in the Clyde Valley area, cycling is for everyone! If you intend in coming along, please email back so that we can estimate refreshments and supplies. So do get there if you can – lots of the usual “freebies”, ie paid for by us, the taxpayers! Seriously, though, we need the data of where we all cycle. So do map your rides, preferably all year round with Strava since we have access to the data (depersonalised) or just for May with this European Cycling Challenge.